Manual Lift Tables speed up work, reduce strain and injuries, and help warehouses comply with federal safety regulations. The ergonomic positioning of work is a quick way to increase productivity, and the BHS Manual Mobile Lift Table (MMLT) makes that task simple. 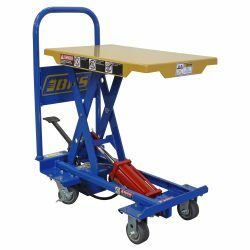 The manual lift table has two rigid and two swivel-with-brake casters for smooth transportation. An angled handle with adjustable grip makes travelling with a load easy and comfortable. Users raise and lower the MMLT with a centralized toggle foot pedal. The MMLT offers a variety of options to get even more productivity gains from your lift table. Choose from two alternate tabletop attachments — Ball Transfer or Roller Conveyor — or talk to our Sales Team to discuss custom tabletop designs. Having the right tabletop for the job helps workers complete tasks with ease. An optional Accordion Skirt Guard encloses the underside of the lift table and protects the lift mechanism from dirt and foreign objects. For more information about the BHS Manual Mobile Lift Table, call 1.800.BHS.9500. Our sales team can answer questions about customizing your lift table or direct you to a local dealer.